This segment is presented by Sara Tinsley, a nurse practitioner from the H. Lee Moffitt Cancer Center and Research Institute in Tampa, Florida. She will be reviewing the dosing and administration of VYXEOS, the first chemotherapy approved for adults with newly-diagnosed t-AML, therapy-related acute myeloid leukemia or AML-MRC, acute myeloid leukemia with myelodysplasia-related changes. So, how do you give VYXEOS? …Days 1, 3 and 5; and 7+3, as you know, the cytarabine is given as a 7-day continuous infusion where the patient is connected to the IV that entire time; and they're usually in the hospital; and then they get 3 days of 15-minutes bolus of the daunorubicin. And then you can see the second inductions, how they compare there. And then for consolidation, there's only 2 days of infusion center or inpatient for VYXEOS -- Days 1 and 3; and for 5+2 in this study, you can see how those are graphed there. And in the Phase 3 trial, 51% of the patients received VYXEOS in an outpatient setting during their consolidation. And premedication in the Phase 3 trial was allowed for nausea and vomiting per institutional protocol. 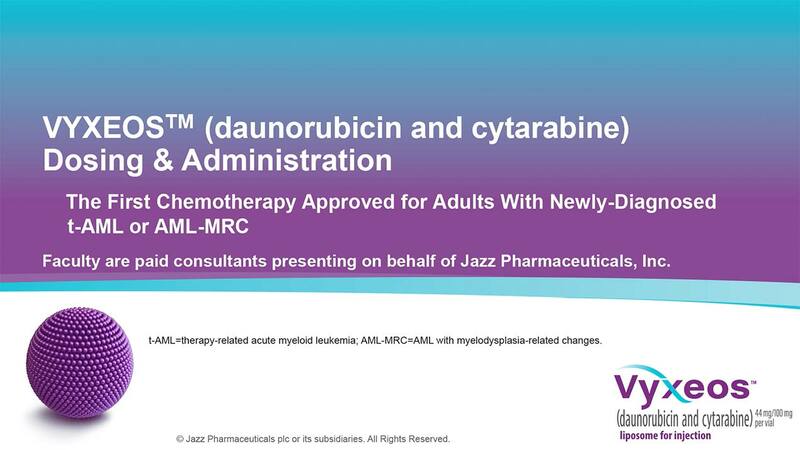 This was on the prior slide -- just the dosing of the daunorubicin and cytarabine, 44 milligrams per meter squared for daunorubicin, and a hundred milligrams per meter squared for cytarabine during the first induction given on Days 1, 3 and 5. …their cardiac function; typically we do an echo or a MUGA. You want to look at the complete blood cell count like we always do; the chemistry profile that has your hepatic and renal function tests in them; and you don't want to start the consolidation until the absolute neutrophil count reaches 500, and the platelet count recovers to greater than 50,000. It's given as a constant intravenous infusion over 90 minutes through an infusion pump. It has to be a central venous catheter, or we use a lot of PICCs -- peripherally inserted central catheters. You don't use an inline filter, and you do want to flush the line after administration with normal saline or 5% dextrose. And of course, like with other chemotherapies, you don't want to mix anything else through that line -- no other drugs go in through it. This is looking at dosing considerations for hepatic and renal impairment for bilirubin 3 or less. The pharmacokinetics of total cytarabine and daunorubicin were not altered with a bilirubin greater than 3; the pharmacokinetics are unknown. …renal disease, the potential effects on the pharmacokinetics are unknown.